Libertines drummer Gary Powell has just checked in with Rhythm to discuss his ever-growing schedule. The likeable sticksman gets back behind the kit for The Libertines next month, and he had plenty to say about the prospect. 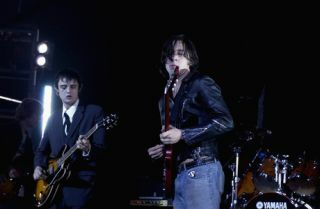 Have you been revisiting the Libertines material to prepare for the shows? "I haven't listened to a single thing yet! We start rehearsing in August and I haven't listened to a damned thing. I think I'll be alright. I will listen [to the albums]. I won't be as flippant as to turn up and expect to remember everything, I know I'm not that clever! At the moment I'm working with my band Invasion Of, I've set up a label, there's way too much stuff going on. The world for me is now way bigger than just The Libertines, that's just a small part." Are rehearsals locked down for August? "I think we start the second week in August then it's straight through to the shows. I think we're doing two shows prior to Reading and Leeds, one for family and friend and one general sale." Has there been much direct contact between you all? "There's been none. Obviously I still speak to Carl (Barat) now and then, I was at his house a few weeks ago but other than that not a great deal. I don't see my friends at the best of times because I'm burning the candle at both ends, working with my bands, DJing and everything. "Considering how we were all together when we started, us four against the world, now because everyone's got their own direction we have all of these concerns which makes it really difficult for us to communicate. Considering our history beforehand was so entwined, I can't see us ever being particularly far away from each other."